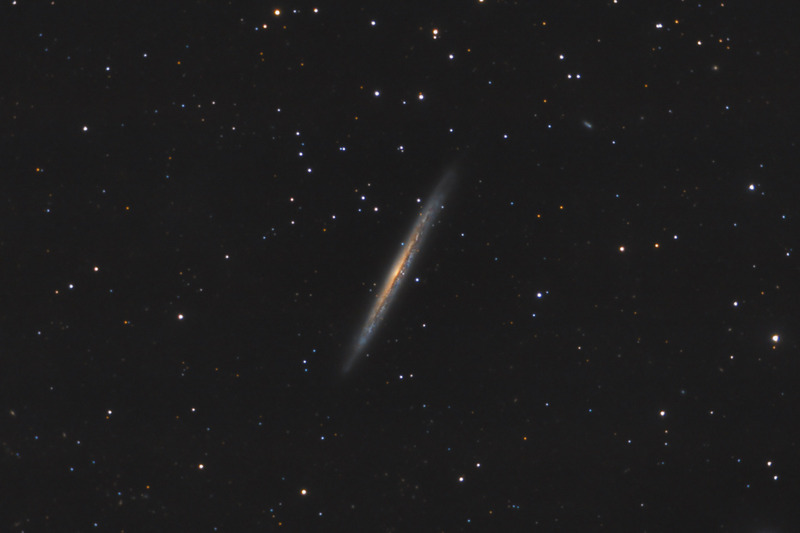 Also known as the Knife Edge galaxy, NGC 5907 is an edge on spiral galaxy that has the unusual characteristic of containing very few giant stars. NGC 5907 also has a very faint and difficult to image tidal stream - several loops of stars that surround the galaxy. Astronomers theorize that NGC 5907 was formed about 8 billion years ago from the merger of dwarf galaxies. The tidal loops are remnants of that long ago merger. In this photo, North is up. This image is cropped to 59% of the original full frame. Software Used Images Plus 5.0 for camera control, Images plus 5.5 Beta for calibration, stacking, ArcSinH stretching, star size reduction and halo reduction, smoothing and noise reduction, advanced Lucy-Richardson deconvolution, and multiresolution sharpening. Photoshop CS5 used for levels and curves, high pass filter, star shrinking, screen mask invert, lab color, saturation adjustments, vibrance, match color, and selective color. Gradient Xterminator for gradient removal. Carboni Tools for additional noise reduction, and smoothing. HLVG for additional color correction. Registar for aligning stacks. Focus Magic for focus restoration. Notes While I'm happy with the details I captured in this image, I was disappointed I wasn't able to capture the very faint tidal loops. I suspect it isn't possible from my location using my equipment, but I may give this another try. Who knows, maybe I'll get lucky! This image won Cloudy Night's April 2013 DSLR Challenge contest! This image was published by Astronomy Magazine as its Picture of the Day for January 3, 2017!